Spurred on by the Byakuyadan, people are now protesting the Kaminarimon Company, which is owned by Denki’s father. The village’s ninjas are summoned to quell the chaos, and each team is assigned a different protest location. 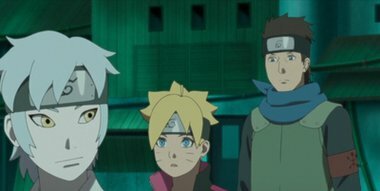 Shikadai, Inojin, and Chocho (Team 10) go to their positions, but Shikadai, noticing something strange on the map, slips away from his post.